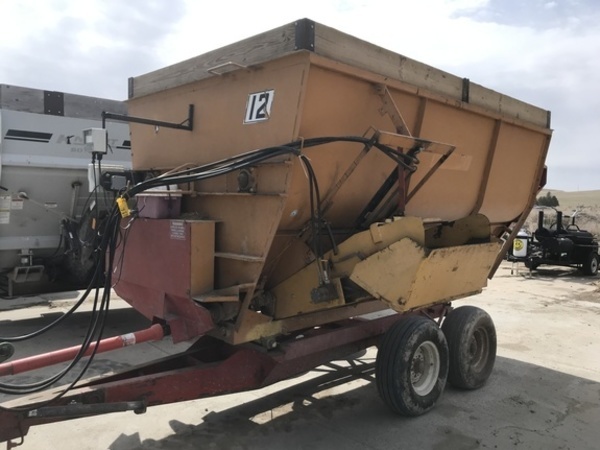 OLDER BIG AUGGIE 12 FEEDWAGON WITH SLIDE TRAY DISCHARGE AND TANDEM AXLE. UNIT HAS A FRONT MOUNT SCALE HEAD TO SEE FROM THE CAB OF THE FEEDWAGON TRACTOR AND A SIDE MOUNTED ONE TO SEE FROM THE LOADER TRACTOR. WAGON RECENTLY HAD WORK DONE IN OUR WELD SHOP AND WAS WORKING THE DAY WE MADE THE SWAP, CUSTOMER WANTED TO GO TO A VERTICAL MIXER THAT WAS A LITTLE BIGGER. WOULD MAKE A DECENT WAGON FOR SOMEONE FOR THE MONEY.